The African Human Rights Law Journal publishes peer-reviewed contributions dealing with human rights related topics of relevance to Africa, Africans and scholars of Africa. The Journal appears twice a year, in July and December. 24 Research and review articles were published in the 2016 calendar year. 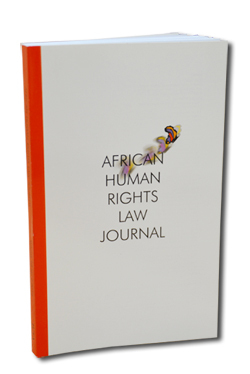 The African Human Rights Law Journal still publishes a small amount of printed copies for each volume which is sent out to the required Legal Depository addresses as per the LEGAL DEPOSIT ACT, Act 54 of 1997. The African Human Rights Law Journal is archived at the UPSpace repository. As democratic practices and the protection of human rights struggle to become rooted in Africa, and an African Court of Human and Peoples' Rights is in the process of being established, the African Human Rights Law Journal has been launched. There is a more pressing need for a monitoring and reporting periodical in this field in Africa than ever before. The Journal aims to publish contributions dealing with human rights related topics of relevance to Africa, Africans and scholars of Africa. In the process, the African Human Rights Law Journal hopes to contribute towards an indigenous African jurisprudence.